If Marijuana Is Legal, Is There Still A Need For Pre-employment Testing? Substance abuse in the workplace remains a significant problem nationwide costing business owners billions of dollars each year. The American Society of Addiction Medicine (ASAM) found that addiction from opioids costs employers approximately $10 billion dollars from absenteeism and presenteeism alone. Additionally, drug abuse in the workplace can also lead to increased injuries, losses in productivity, and other costs associated with theft and administrative burden. Employees that are abusing illicit substances are three and a half times as likely to have an accident on the job, and five times more likely to have an off-the-job incident that will impact their performance at work. Excess job turnover also contributes to these costs. Only 58% of people with opioid use disorders had the same employer throughout the previous year, compared to 75% of the general population. Workforce drug positivity rates are the highest they have been in a decade, according to Quest Diagnostic’s 2018 Drug Testing Index, and while 70% of the estimated 14.8 million Americans who use illegal drugs are employed, the legalization of marijuana has some organizations questioning the purpose of their drug testing programs. If marijuana is legal, is there still a need for pre-employment testing? The important thing to remember is that the drugs often times at the root of safety and cost concerns for employers include other substances including cocaine, heroin, ecstasy, methamphetamine and prescription drugs. Many criminal justice programs, including probation and parole departments have removed THC from their testing panels and replaced it with opioids that are fueling crime in their communities. They have adopted more relevant testing panels to include oxycodone, fentanyl, and other opioids. At the peak of the opioid epidemic, it is more important to drug test than ever before. While we may not consider THC to be something critical for corrections or employers to test, it seems catastrophic to eliminate drug testing programs in general with the current landscape. The positivity rate for cocaine increased for the fifth consecutive year in the general U.S. workforce across every specimen type reported by Quest Diagnostics. In urine testing, the positivity rate for cocaine increased seven percent in the general U.S. workforce. Year-over-year increases were also observed in the general U.S. workforce in oral fluid testing (up 16%). An analysis of trends in the general U.S. workforce based on the four U.S. Census regions also identified large increases of methamphetamine positivity rates. Between 2013 and 2017, methamphetamine positivity increased: 167% in the East North Central division of the Midwest (Illinois, Indiana, Michigan, Ohio, Wisconsin); 160% in the East South Central division of the South (Alabama, Kentucky, Mississippi, Tennessee); 150% in the Middle Atlantic division of the Northeast (New Jersey, New York, Pennsylvania); and 140% in the South Atlantic division of the South (Delaware, District of Columbia, Florida, Georgia, Maryland, North Carolina, South Carolina, Virginia, West Virginia). The percentage increase in these four divisions ranged between 9%-25% between 2016 and 2017. Retailers are at an increased risk of drug abuse due to their typically high employee turnover rate of temporary, part time and seasonal employees. Drug use tends to be higher among these employees because many addicts realize they will be turned down for other permanent positions that often require pre-employment drug testing as a prerequisite of employment. According to results from a recent survey published on Detox.com, 14.07% of respondents who reported using drugs on the job worked in the retail sector; the most common reported industry for employee drug use compared to 9 other segments. There is also a significant correlation between illicit drug use and loss of product through pilferage and shrinkage. On average, employee theft made up 33.2% of all inventory shrinkage in 2018 – according to the results from the National Retail Security Survey. In retail the likelihood of theft is greater than in some other business segments. Drug testing programs, particularly for retailers who have expensive inventory and concerns with employee theft should be geared toward identifying drug users with expensive habits like prescription opioids or methamphetamine. These users are more likely to steal expensive inventory from their employer to support their habit. It is typically not the recreational marijuana smoker. As the landscape of drug abuse in the workplace evolves, so does the testing technology and methodology for which employers can utilize to protect the safety and well-being of their organization. While urine currently remains as the most recognized means of drug testing, increasingly more and more organizations have made the switch to oral fluid testing for the many practical and financial benefits it provides. While every drug and donor is different, oral fluid testing can detect drugs and alcohol shortly after use when employers require immediate action. Having the ability to administer the test onsite and while observed makes testing with oral fluid ideal when employees are under the suspicion of impairment or when the need arises to act following emergency situations such as accidents, etc. Oral Fluid also alleviates adulteration concerns, helping employers to remain confident in the integrity of their results. 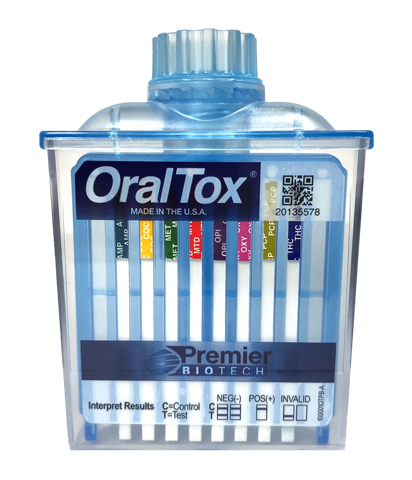 Premier Biotech’s patented rapid oral fluid device OralTox has now been granted the first-ever FDA clearance for the detection of Oxycodone in oral fluid. Now with FDA 510(k) clearance for the following 8 drugs: Amphetamine, Cocaine, Marijuana, Methadone, Methamphetamine, Opiates, Oxycodone and Phencyclidine. Rapid testing with Premier Biotech’s OralTox, employers now have the ability to effectively test for the drugs negatively affecting the organizational health of their business. For employers, the risks associated with not drug testing is clear. Amidst the changing climate surrounding marijuana legalization and the ongoing surge in substance abuse in the workplace, drug testing remains a critical tool for pre-employment, post-accident, reasonable suspicion and randomized testing employer needs. To learn more about OralTox or how our innovative oral fluid testing products and solutions can help protect your organization, contact Premier Biotech today.